Showing results for tags 'btc-e'. 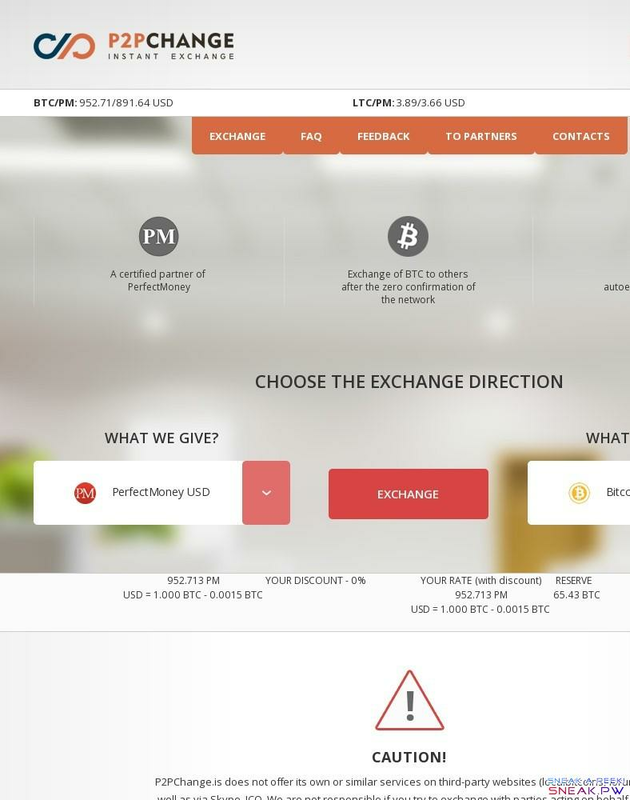 P2PChange.is - service is intended for those who want quickly, safely and on the favorable rate to exchange such types of electronic currencies: Bitcoin, BTC-e, Litecoin, Perfect Money, Payeer, working since June, 2013. Features: Instant exchange (without confirmations of a network) with Bitcoin on other directions, in case of observance of small conditions. Protection against failures of access to payment service providers. Certified partner of Perfect Money, TrustScore more than 500. Discounts for regular customers to 50%. More than 50000 clients who trust us. Partner program: In our service the loyalty program, an accumulative discount and the partner program works, having taken an advantage of which, you will be able to make an exchange of electronic currencies on more advantageous conditions. For this purpose it is necessary just to be registered on the website. We offer the partner program to all clients and webmasters. 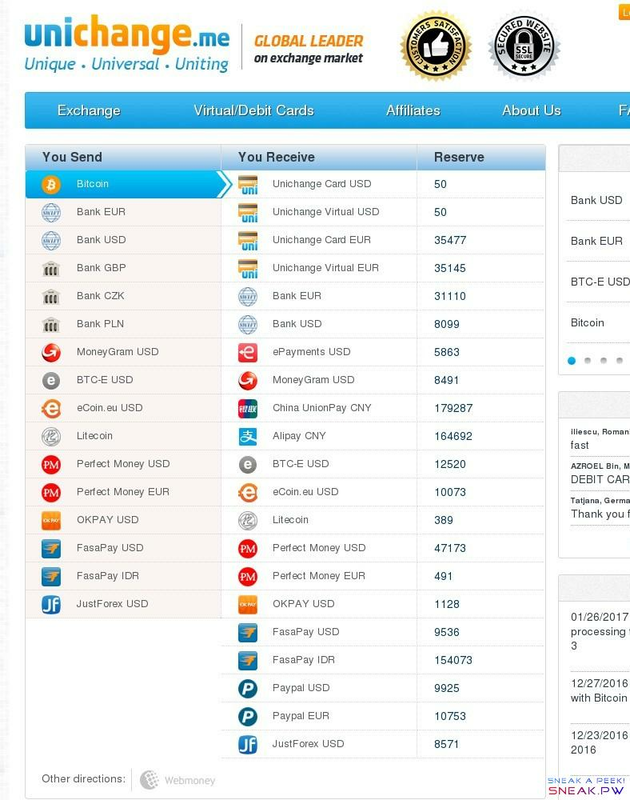 Unichange.me is the best e-currency exchanger where you can buy, sell and exchange ecurrencies. Besides you have the opportunity to withdraw Perfect Money to debit \ credit card Visa/MasterCard and to send to Western Union or wire transfer on our website. 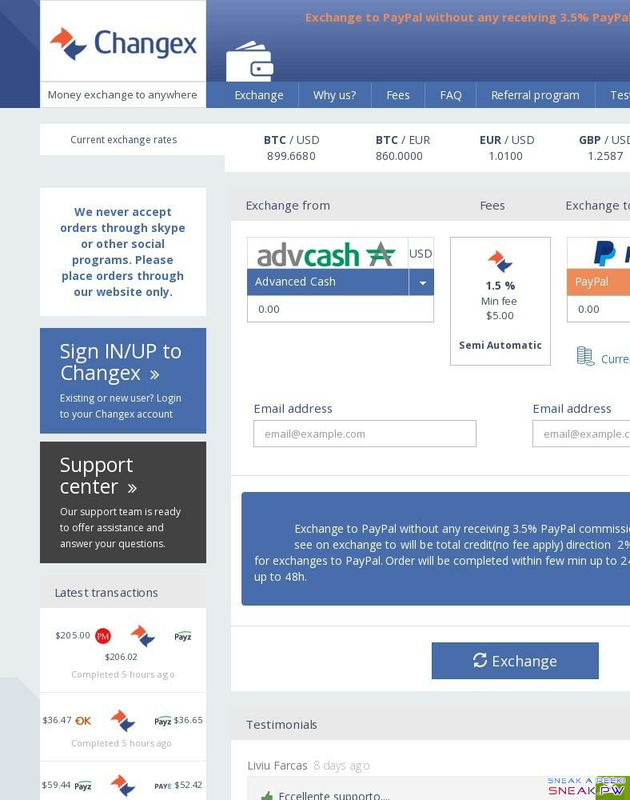 If you need a safe online exchanger in order to buy Bitcoin or Litecoin, we will be happy to provide you these services. Besides we offer different ways to cash out Bitcoin and Litecoin: withdrawal to Visa / Mastercard, Western Union and international wire transfer. We provide you the possibility to cash out BTC-e code to debit \ credit card and Western Union and to buy BTC-e in bulk via wire transfer. Also, we offer the most convenient ways to withdraw Okpay to card, wire transfer and Western Union. 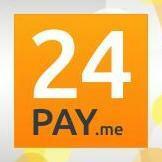 We provide online e-currency exchange under best terms: here you can buy and sell e-money at the best rates. Besides you have the opportunity to make money on our affiliate program getting up to 20% of your referrals´ transaction fees! Getting profit due to Unichange affiliate program will be a nice bonus for you.